a replica of my poor old pole lamp. I’m working toward making my sewing room into a mixed media craft room. Last week I made the declaration; this week I’ve begun making some plans. It’s a small, only 12 ½ by 13 ½ feet, and it’s got 2 large windows, a small triangular-shaped closet in one corner with a door and a door to the upstairs hallway. 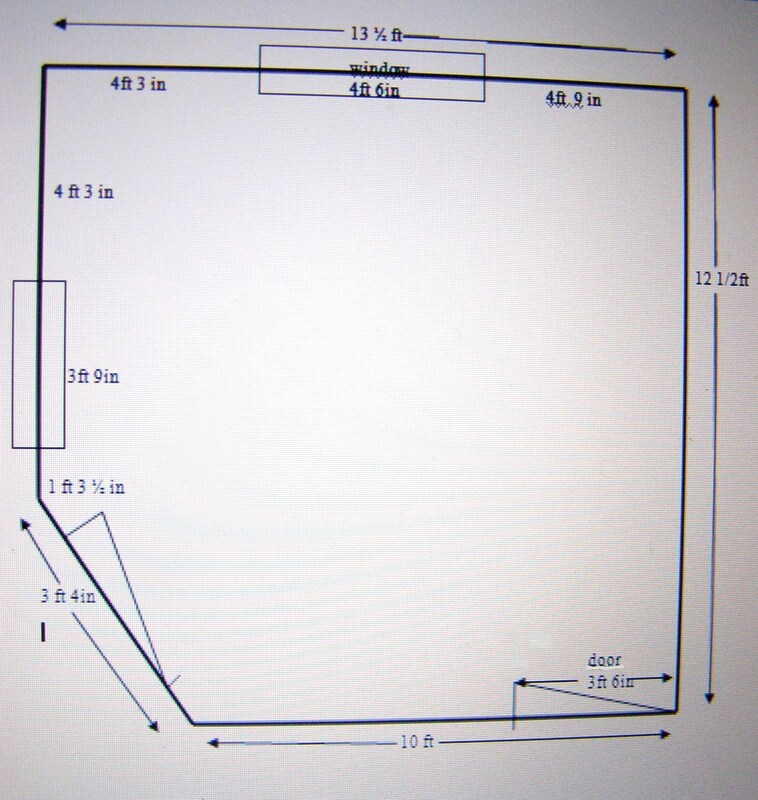 The room measurements and shape, they may not be exact. Large windows facing the east and south letting in a lot of natural light. The closet, that will make great storage if fitted with shelves. It’s small so I can’t just add another shelving unit or more bins to control the clutter. I may actually have to get rid of some things to make room for others. The windows and doors, as they take up valuable wall space, plus the fact that I tend to work in there at night so all that great light is pretty much wasted. I spent most of the week thinking over what my needs are, and how to use the room to it’s best advantage. I want to keep my sewing machine, fabric and notions; just not as much. When I was a costume designer, I needed to keep a lot of fabric; it came in handy so I wouldn’t have to always run out to the fabric store when building costumes. I also sewed a lot of my own clothes. I don’t really much, anymore. I would like to cut my collection of fabrics in half. That should give me more room to add a work and storage area for painting and other mixed media work. This one is going to kill me, I hate the thought of getting rid of my fabric stash. I also have a ton of patterns but I’m not ready to get rid of those yet. Even though in last week’s posting I said that I would not spend any money on furniture, I may need to buy some lighting, since my overhead light is really inadequate. I only have one task light that I end up carrying all over the room. My other, an old 1960-something pole light, doesn’t work very well anymore. It’s really too bad, I liked that old pole light. I inherited it from my parent’s house when I went off to my first apartment in 1975. I don’t think they make pole lights in this day and age. 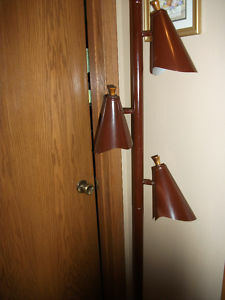 For those too young to remember pole lights, there were three lights on one pole which was held in place with a tension rod. The lights, on cone-shaped shades could be aimed in different directions to focus the light where it was needed. The shades on my pole lamp were originally plastic, in white, orange and turquoise. They eventually broke apart so I replaced the cones with small basket shades, cutting holes to fit them on the hardware. That was in the 80’s when earthtone colors were big. I will look around the local second-hand stores or Ebay to see if I can find an inexpensive replacement. Who knows, I may find another pole lamp to replace mine. This entry was posted in biographical, cleaning, organization and tagged biographical, organization. Bookmark the permalink. You’ve made a start with the measurements. My studio is still set up for its “before” shot. You may want to look at the lamps at Target, not rel pole lamps, but they used to have a variation.